Sometimes referred to as ‘liquid gold’, argan oil is one of the rarest oils in the world. Despite its recent rise to popularity, it is not a new product. In fact, it’s been utilized in Morocco for its nourishing and healing properties for thousands of years. The robust, nutty oil is most commonly used as a moisturizer on the skin and hair, but can also be used to add flavor to foods, like salad dressings and soups. There are two grades of the oil – culinary and cosmetic. Culinary, unsurprisingly, is the edible version, and is similar to olive oil, and cosmetic is the grade used in skin and haircare products. Argan oil is completely natural, easily absorbed, non-greasy and non-irritating, making it a fantastic all-round beauty product. The oil is produced from the argan nut, which grows on argan trees, local to south-west Morocco. Argan trees used to cover a large area of North Africa, but have reduced greatly in numbers, making it quite pricey. The Argan forest in Morocco has been a designated UNESCO protected biosphere since 1998, making argan oil a sustainable product. 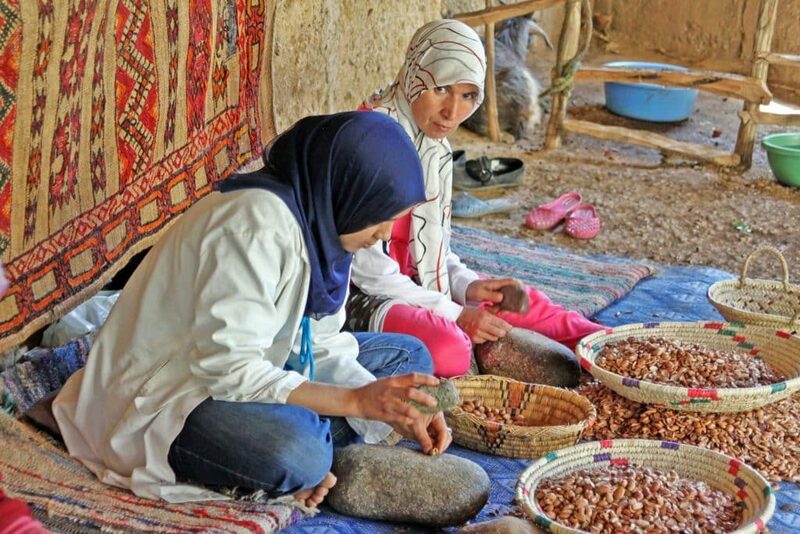 Local Berber women work in fair trade co-operatives, hand cracking the argan nuts between two stones, which is a technique used over centuries. They extract the raw kernels from the hard shell, grind them in a stone grinder and knead them for hours, all by hand. Then they are first cold-pressed into oil. It takes one woman three days to make a liter of argan oil. This nourishing oil gives has the ability to simplify your beauty routine, giving you a go-to oil to use on its own, or as an essential ingredient in homemade remedies, like body scrubs or lip exfoliators. Argan oil is bursting with healthy fatty acids, vitamins, minerals and antioxidants that promote health through moisturizing, softening and hydrating your face and hair, as well as protecting them from sun damage. And all this without any harmful toxins or Parabens! A number of studies have shown that argan oil may help to prevent cardiovascular disease, and consuming the golden oil could protect against atherosclerosis and cancer through its various biological mechanisms. With its abundance of nutrients, including unsaturated fatty acids, the oil helps regulate blood cholesterol and lower blood pressure. Studies have shown that it can help improve blood circulation throughout the body, ultimately reducing the risk of cardiovascular disease. Including argan oil in your diet is a safe way of consuming your recommended fat intake without risking heart health. The high antioxidant content of argan oil helps repair cellular damage in the body, which reduces the risk of cancer cells being able to grow. Recent studies have shown argan oil to reduce the rate of cell division of prostate cancer. A 2006 study, in particular, found that it may be able to slow the growth of several types of prostate cancer cells, and could play a role in new prostate cancer prevention strategies. Because of its abundance of antioxidants, it is possible that argan oil could protect against other forms of cancer as well. Argan oil is used regularly in Morocco to treat diabetes, and studies have found that it does decrease insulin resistance in people, which is usually the first step to diabetes developing. It was found that the oil enhanced the cellular response to low doses of insulin, which is a process that gets disrupted in diabetes. Argan oil has shown to help combat diabetes by reversing metabolic changes in people who consumed high-sugar diets. A 2011 study published in the International Journal of Endocrinology investigated the effect argan oil consumption had on serum lipids, apolipoproteins (AI and B), CRP, and LDL susceptibility to oxidation in type 2 diabetes sufferers. Researchers found that eating the oil might have an antiatherogenic effect, by improving lipids and apolipoprotein AI. They concluded that argan oil could be used in nutritional management for type 2 diabetes patients. Not only can argan oil be consumed and used as a skin moisturizer and hair conditioner, but it can also be applied topically to the skin to treat conditions, including eczema, psoriasis, chicken pox, bug bites and skin rashes. Argan oil’s healing power comes from its rich vitamin A and E content, as well as its antioxidants, omega-6 fatty acid and linoleic acid. Research has found that argan oil eases inflammation when applied directly to problem areas. It was initially thought that its anti-inflammatory power might have been because of its high oleic acid content, because a linoleic acid deficiency can cause poor wound healing. However, many other oils are rich with the monounsaturated fatty acid, and yet don’t have the same therapeutic effect as argan oil. Researchers therefore attribute its healing ability to its composition of unsaponifiable matter (although relatively low), and high tocopherol content. 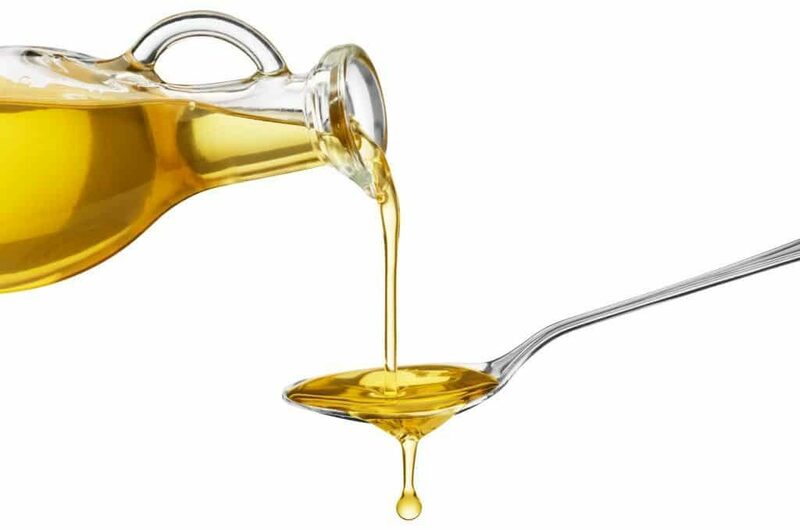 Tocopherols are molecules that have strong antioxidant and free radical scavenging properties, and, because tocopherols and sterols can work together, this specific combination of molecules found in the unsaponifiable matter may, theoretically, contribute to the oil’s anti-inflammatory power. The powerful antioxidants in argan oil have the ability to boost the immune system by stimulating proper immune function. A study was conducted on rats in 2006, with one of five diets fed to them over four weeks, including fish oil, argan oil, olive oil, coconut oil and sunflower oil. The fatty acid composition of plasma and thymocyte lipids was then analyzed and researchers found that argan oil, like olive oil, had a positive influence on immune cells. 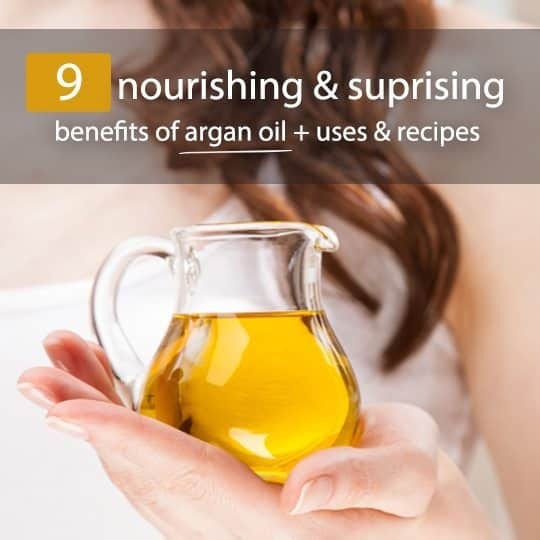 This is one of the better known benefits and uses of argan oil. Its high vitamin E content prevents evaporation of moisture from the outer layer of skin, which means your skin will remain hydrated. Eighty per cent of argan oil’s content is also made up of essential fatty acids, which help reduce wrinkles by maintaining healthy skin cells. They allow the skin to function properly, producing collagen, retaining water, and staying generally plump and youthful. The antioxidants in argan oil also benefit and protect the skin, by helping fight free radicals, protecting the skin from harmful environmental toxins. A study into the effect argan oil has on postmenopausal skin elasticity found that both consuming it, and applying it as a moisturizer directly onto the skin, had anti-ageing effects on participants. Argan oil has been shown to increase the concentration of pepsin in the gastric juice of the stomach, which is an important enzyme that digests proteins found in meat and other animal products. 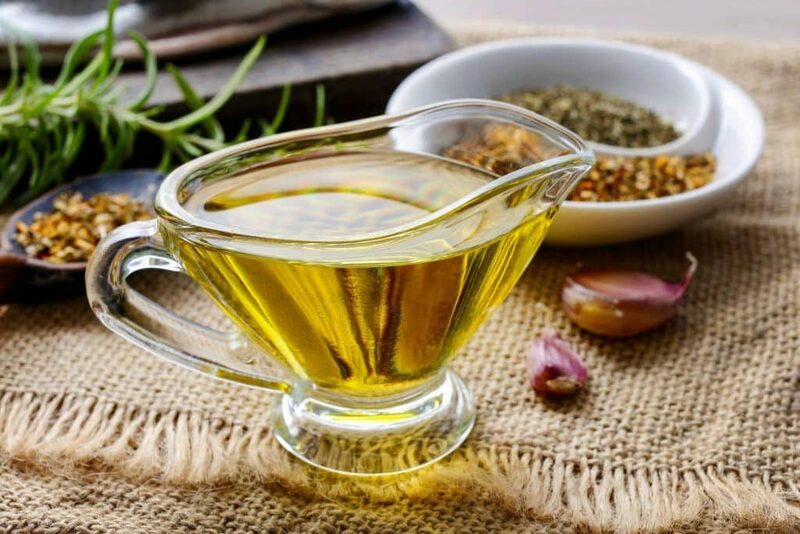 That means consuming culinary grade extra virgin argan oil expedites the digestive process, and it is therefore a beneficial oil to cook with or use in salad dressings to encourage a healthy digestive system. 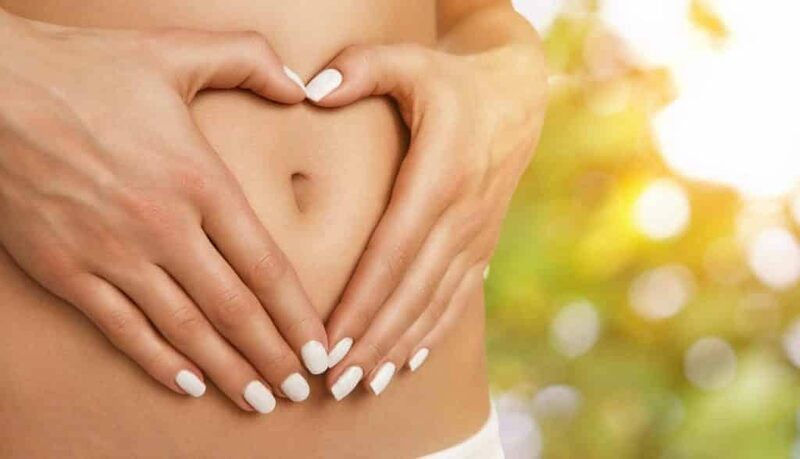 Better digestion means more energy, less hunger and easier weight loss! This might even be a more well-known use for argan oil than skin moisturizer. The linoleic and oleic acids in the Moroccan oil help keep hair hydrated by locking in moisture, increasing its natural shine. Not only that, but it can help control and straighten frizzy hair, as well as repair heat-damaged hair from instruments like curling irons and straighteners. As well as its anti-ageing benefits for the skin, argan oil can also be used as a preventative cosmetic oil, to protect the skin from ultraviolet radiation. The carotenoids that naturally occur in the oil protect it from sun damage, while the sterols in it assist in reducing inflammation, which improves the skin’s metabolism process, ensuring moisture retention. Not only that, but it is also a dry oil, meaning it doesn’t clog pores. Bath Oil – Add a few drops of argan oil into your bath, either on its own, or along with Epsom salts. Soak and allow the salts to melt away tension in your muscles while the argan oil nourishes and moisturizes your skin! Face Moisturizer Or Serum – Argan oil can be used instead of a moisturizer. Simply massage a few drops directly onto your face and neck after cleansing, morning and night. Because it’s a dry oil, it will absorb quickly, not causing greasiness or clogged pores. If you’re using it as a serum rather than a moisturizer, simply apply a few drops and pat them into your skin, let it absorb and follow with your day or night cream. Toner – Argan oil can be added to your regular toner to add a hydrating effect to your toning routine. Rose water works well as a natural toner, so if you want to create your own – you can mix a few drops of argan oil into rose water and use it morning and night after cleansing, and before using serum or moisturizer. Face Mask – You can simply add a few drops of argan oil to your store-bought face mask for added hydration and softness, or you can make your own. Here are some DIY argan oil face mask recipes with different benefits, from exfoliating to anti-ageing. Body Oil – It can also be used directly on your skin – all over your body, to hydrate, moisturize and soften. Again, because it is a dry oil, it will absorb quickly and won’t leave your skin feeling greasy. It can also work to reduce the visibility of stretch marks when massaged generously into the area daily. Cuticle Moisturizer – Argan oil can help heal and soften cuticles, while strengthening nails and promoting growth. Simply massage a small amount over your cuticles and nails –toes and fingers. Skin Repair Ointment – It can also be used to repair and moisturize thick dry areas of skin, such as cracked heels and dry elbows and knees. You can apply argan oil to your heels, as well as all over your feet and toes, cover with socks, and leave on as an overnight treatment. In the morning, your heels should be soft and smooth! 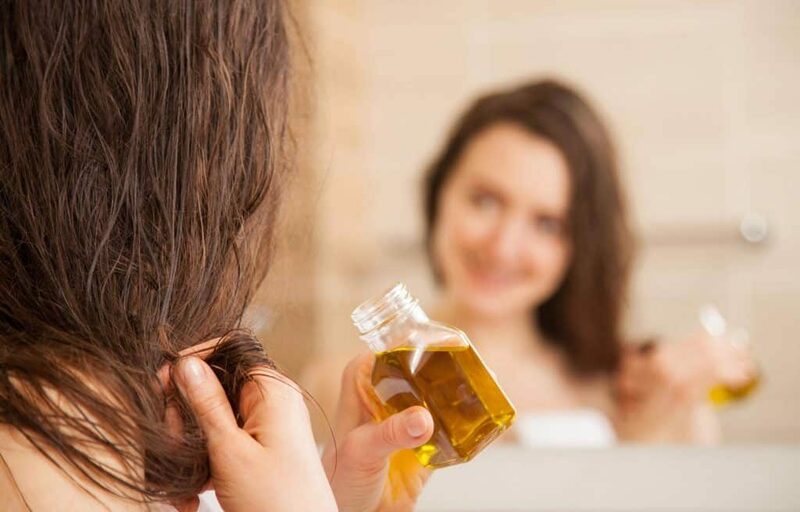 Hair Oil – Moving away from the skin to the hair, argan oil is also famous for its ability to treat and moisturize hair. After shampooing and conditioning, add a few drops of argan oil to your hair and massage it through your ends. You can apply it all over, including your scalp, or, if you have naturally oily hair, you can apply from halfway down, through the ends, avoiding the scalp. Style as usual – either letting your hair dry naturally, or blow-drying. Overnight Conditioning Treatment – Massage a generous amount of argan oil all over your hair – including your scalp (even if you have naturally oily roots and dry ends). Cover with a hair wrap and leave it on overnight while you sleep. Wash your hair as normal in the morning with shampoo and conditioner and see how soft and shiny your hair becomes! Lip Scrub Or Ointment – You can mix a few drops of argan oil with granulated sugar to create a lip scrub. Lightly massage into your lips and rinse off. It will get rid of any dry skin and leave your lips looking and feeling smooth and soft. You can also add argan oil to your regular lip ointment, or add it to pawpaw ointment or lanolin to make your own. Kumato Avocado Salad – This juicy, tasty kumato tomato salad is full of healthy essential fats from the avocado and argan oil, as well as vitamins, minerals and antioxidants from the tomatoes, white wine vinegar and lemon juice. Perfect summer lunch or side salad! Carrot-Raisin Salad With Argan Oil & Lime Dressing – This salad is bursting with sweetness and flavor! And with just four ingredients (plus salt and pepper to taste), it’s incredibly quick and easy to whip up! This recipe calls for raisins, carrots, lime and argan oil, for that perfect, refreshing summer salad. Moroccan Almond, Honey & Argan Oil Spread (Amlou) – I’ve saved the best for last! If you’re a fan of almond butter or peanut butter, then you are going to love amlou – a traditional Moroccan spread, made with healthy, natural ingredients. All you need are almonds, argan oil, dark honey and a little bit of salt (optional). Simply blend in a food processor until it turns into a peanut-butter-like spread!